We would like to congratulate two high school grads for being drafted in Major League Baseball’s Arizona Diamondbacks. Francis Christy is a Casa Grande High School grad who is a Junior at Palomar College was drafted in the 7th round of the MLB draft on Tuesday. We recently shared an article on him in our social medial feeds in May,. Palomar’s Christy grows up Comets catcher has matured and figures to be a high pick in the June draft. He previously was named California Community College Player of the Year and National Community College Player of the Year, was drafted in the seventh round by the Arizona Diamondbacks on Tuesday. He was the first player taken in round 7 and the first California community college player selected in the draft. He also was the first community college catcher in the nation taken in the draft. The 6-foot-3, 220-pound sophomore, who signed a letter of intent with the University of Washington prior to Palomar’s 2015 season, batted .316 with a state-leading 11 home runs, 52 RBIs and 43 runs scored in 45 games as the Comets went 37-8 and finished third in the California State Tournament. Daniel Comstock a Petaluma High School grad, who was Empire District Player of the year in 2012, was picked up in the 18th round of the MLB draft today. 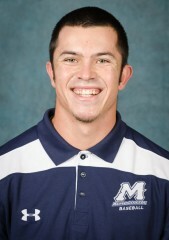 Comstock, also a catcher, hit .317 in 50 games for Menlo Oaks during the 2013-14 season. He was second on the team in home runs (4) and third in RBI’s (29) and second on the team in on-base percentage (.408) that year which earned him a spot on the All-NAIA West Group Team. In his 2014-15 year he hit .393, 16 home runners, and 56 RBIs with a .482 On Base Percentage. On June 3, 2015 Comstock was named NAIA All-American. Two hours ago Comstock tweeted this on his Twitter page. Awesome, congratulations! We are super proud of you. Previous Previous post: VIDEO: Do You Know What The California Water Conservation Laws Mean To You?